After a quarter century of marriage some wedding gifts fade from popularity and lose their shine. One of our most surprising but delightful wedding gifts was an antique English sterling punch bowl given to us by one of my professors with the witty quote above. I look at that punch bowl every day as it corrals our outgoing mail right by the front door. Once upon a time, a punch bowl was a wedding registry staple. Today, not so much. That is unfortunate as there are so many novel ways to use a punch bowl. Perhaps you’ve got a punch bowl gathering dust in the back of a cupboard or maybe you’ll come across a beauty available for a few dollars in a yard sale. It is time to reimagine the punch bowl for today’s lifestyle. 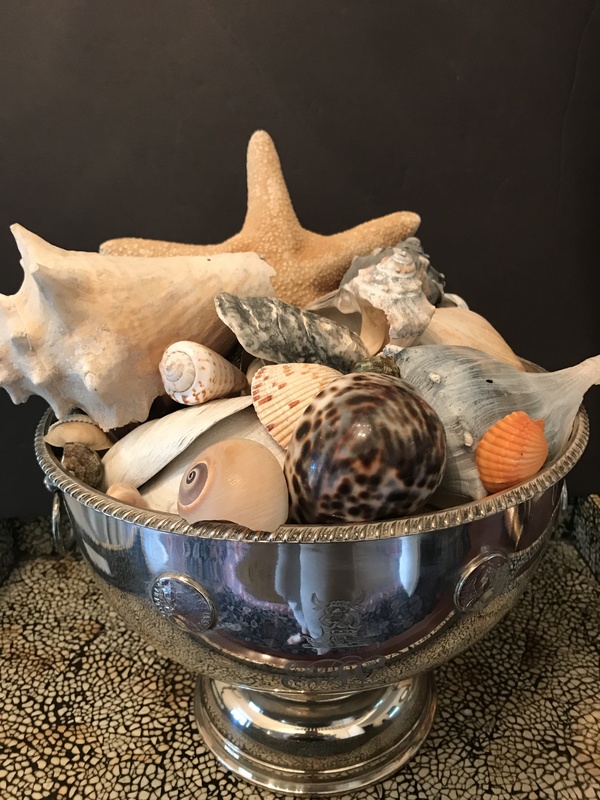 This post will give you some ideas of how I use some of our punch bowls and inspire you to show yours some love. 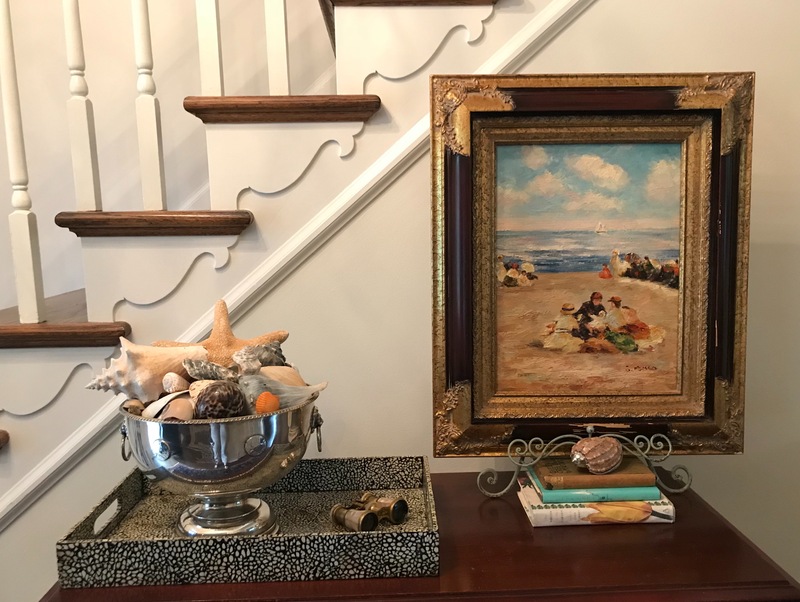 In summer, I heap sea shells in a punch bowl on a hall table for a no-fuss, no-maintenance seasonal vignette. The punch bowl is three quarters filled with crumpled newspaper first which is then topped with the sea shells. Used as a cache-pot, I often fill my punchbowl with flowers. 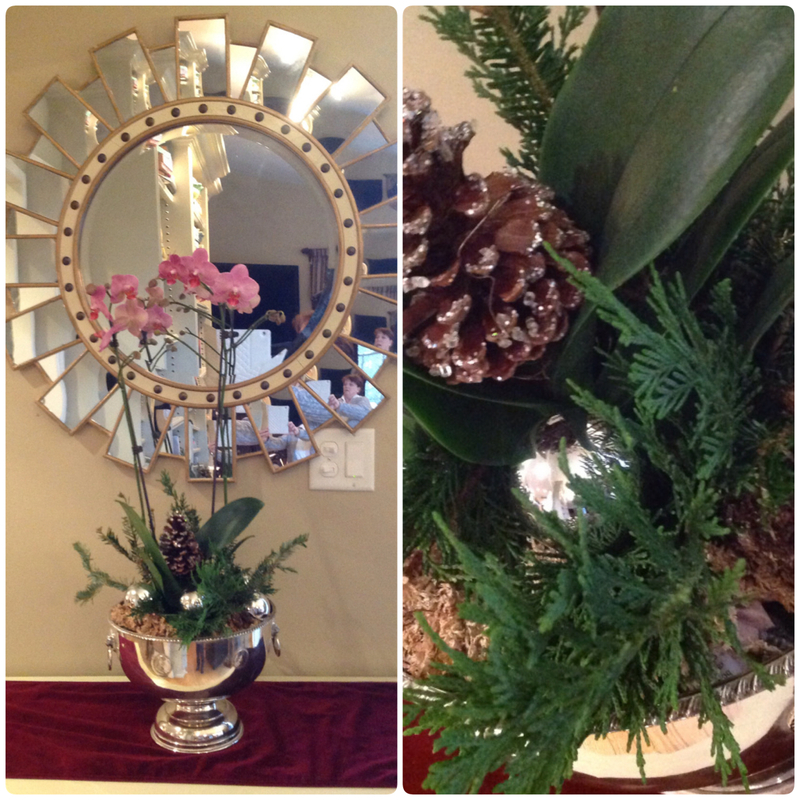 This holiday arrangement of orchids, glittery pincones and greens is a show stopper yet simple to execute. It elevates a supermarket orchid to high-end florist glam. More ideas on elevating supermarket flowers can be found here and here. A simple floating floral centerpiece with blooms and floating candles is stunning on a sideboard in the dining room for dinner party ambience. Here I am floating early spring hellebores but substitute any flowers that will float. Open, flatter flowers will do best: echinaceas, daisies, mums, helianthus are all good choices. Situate this kind of arrangement so it can be appreciated from above. So pretty and whimsical. Float apple-votive holders with star anise spice for scent and everything is nice for fall! This is another seasonal favorite and an elegant take on popular “bobbing apples”. I call this candle light apples! To make the apple “votives” simply carve out a bit off the top of each apple the diameter and depth of a small standard candle votive, the kind with the little metal bases. Place the candles in the carved cavities and light them when ready. The apples will naturally float. For more detailed instructions please visit this blog post featuring a fall tablescape using this concept. Another fall arrangement could be created simply by filling the punch bowl with apples and twisting a branch of bittersweet vine artfully across the top. 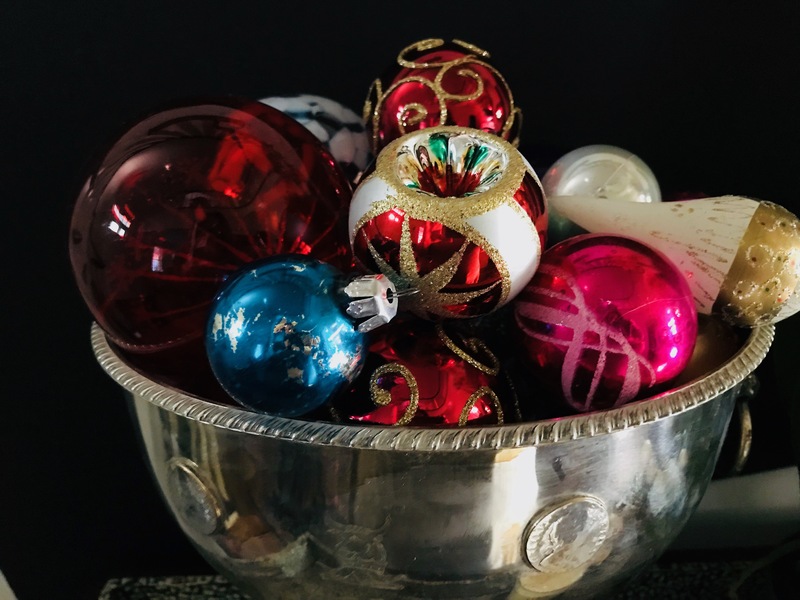 The easiest holiday centerpiece you will ever create is one where ornaments are piled high in a punch bowl. Simple, classy, festive and no-fuss, no-maintenance all season long. 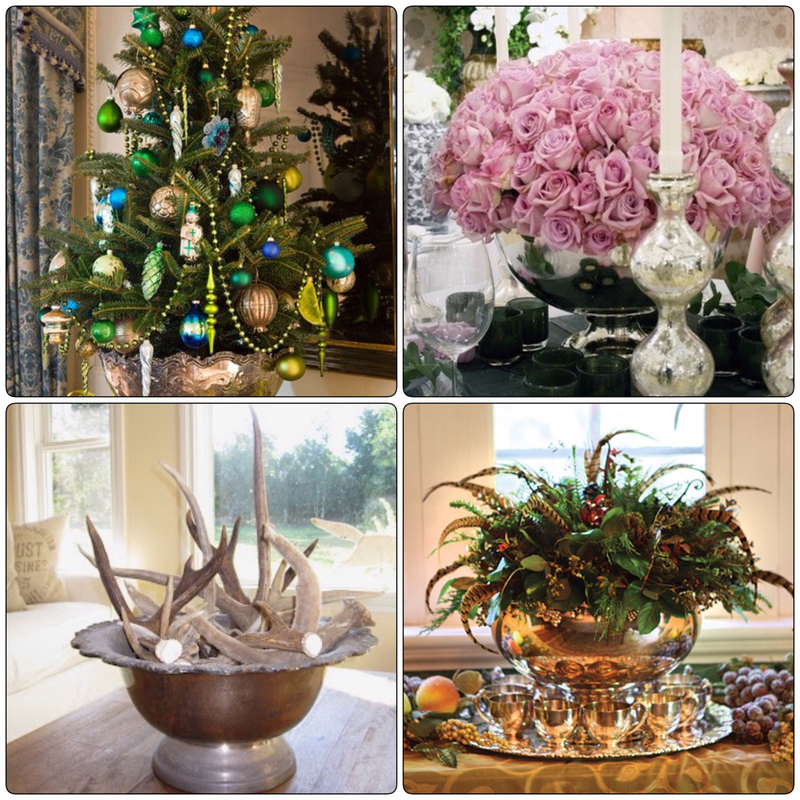 Choose ornaments of different sizes, shapes and with some shine for a bit of holiday sparkle. I place special vintage ones on top where I can enjoy them. At Easter time, the punch bowl is overflowing with colorful Easter eggs of different sizes. Do you see a theme repeating itself here? LOL. Enjoy more Easter décor ideas here. Heaped up with marble and ceramic Easter eggs, it makes a festive seasonal centerpiece. Because of their generous size, punch bowls are natural, but classy, vessels to coral things. 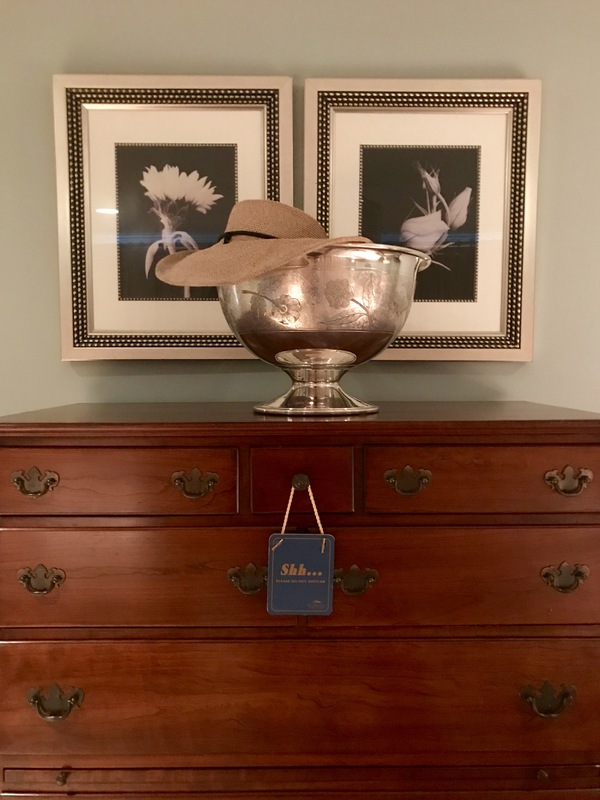 We use one for outgoing mail and another in the master bedroom to hold summer straw hats out of sight. There are visers and other hats hiding in there! An elegant catch-all or outgoing mail central. Of course, you could always use a punch bowl conventionally and throw a party! If you do, count me in! 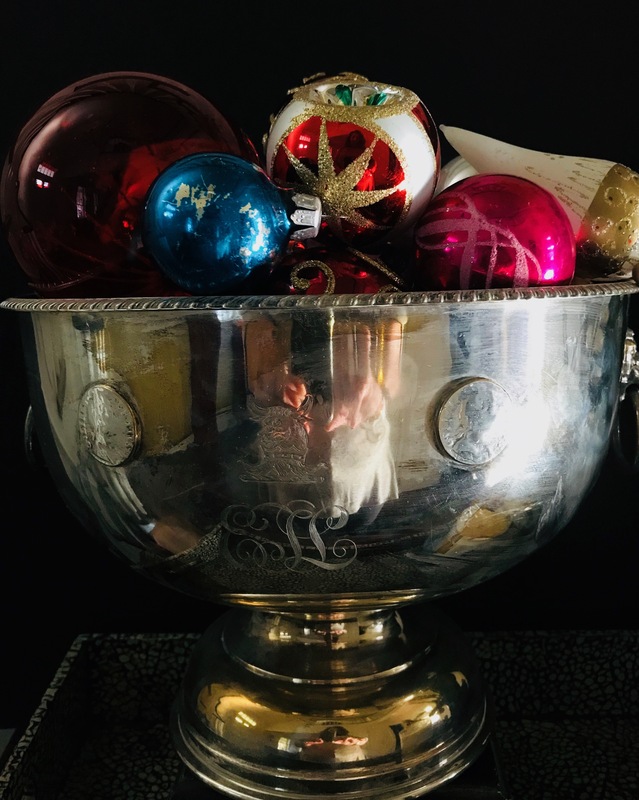 This entry was posted in Home Décor and tagged candlelight apple centerpiece in a punch bowl, floating apples in a punch bowls, floating flower centerpiece, new uses for punch bowls, punch bowl flower arrangement, Punch bowls 2.0, reimagining the punch bowl by Johanne Lamarche. Bookmark the permalink. Love the seasonal decorating. It’s so nice to have some “old” things in the house with mixed purposes. You’ve made me want to look for a punchbowl! Thanks Liz! Have fun looking for a punch bowl of your own! I had an etched glass one from my parents that got lost or broken over many moves and I wish I still had that one too. Glass ones would have a whole other look to them. Nice to hear from. you! I love it I love it I love it! 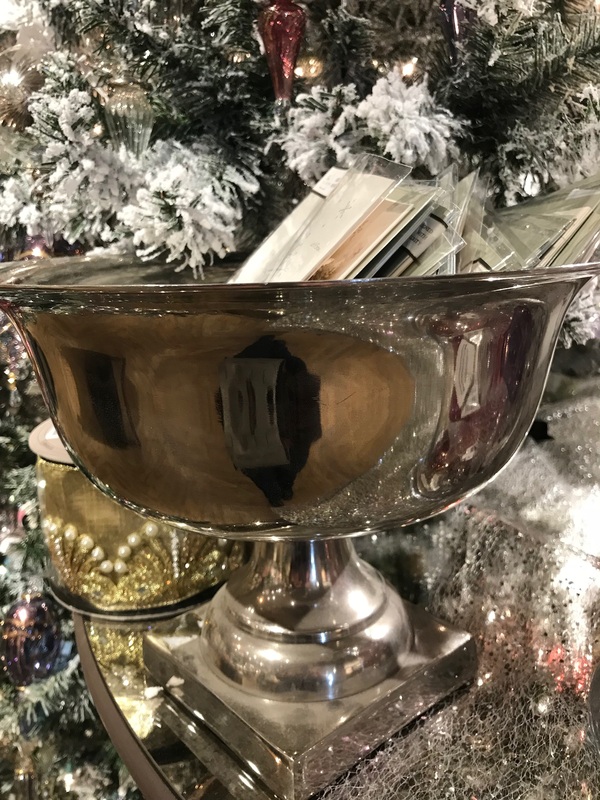 I have a silver (plate, unfortunately) punchbowl I am going to have to dig out! I have another, too that’s part glass and part mercury glass. So much better to use something than have it hidden away in a dark buffet. Like I told my StepMom – if not now, when? Great Post!! The silver/mercury glass one sounds gorgeous Mollie! I’ve had this post in my drafts for 2 years! Kept trying to remember to take seasonal pictures. Glad you found inspiration to dust yours off! I think my big one with the etched flowers is silver plate. Who cares? It’s beautiful and I love using them! Post a picture of your creation please! I wish I had more blooming now! A lot of phlox, some monarda and my daylillies. Not much to bring inside. I might have to do a little foraging! Also had a lot of volunteer sunflowers this year out back – they might still be going!